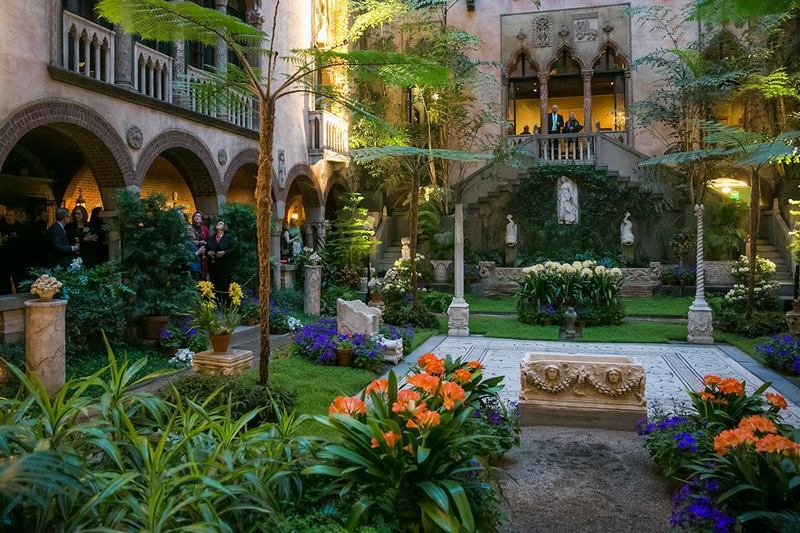 This is the second part of a Post I published last week Isabella and her love for Art and Gardens, on it, I talk about the amazing life of the Gardner family, its trips, and their lifestyle that lead them to build the Isabella Gardner Museum. Isabella Stewart Gardner was passionate about art and culture, she became interested in the gardens she saw while traveling all around the world and wanted to leave her legacy through art; this Museum is the accomplishment of those interests, with, of course, her personal and intimate touch. Her museum is a mix of styles, gothic, renaissance, roman and byzantine, famous because of its great art pieces, nevertheless, the garden courtyard is also an essential part of the building, with floral exhibitions of new and full-grown plants that change constantly during the year, according to seasons and blooms. Every month the courtyard has a floral theme and color, therefore it has become as essential and iconic as every part of the museum. Every seasonal display in the courtyard contains 300 to 500 plants. Each plant is placed in the courtyard for around 7 days, after that, they have to replace it with another identical one; there’s a lack of sunlight in the courtyard, caused by the tall walls so close to each other and the plants can suffer having low light. The most traditional display is the long Nasturtium (Tropaeolum majus) hanging from the third-floor balconies as Gardener used to in the early 1900’s. Tropical and subtropical plants fill the courtyard: lots of Orchids, norfolk island pine (Araucaria heterophylla), tree ferns (Cyatheales), fishtail palms (Caryota), areca palms and ferns. This display is inspired by old images of plants placed by Isabella. (You can also grow this plants at home, in a room with indirect light and high humidity). Exotic orchids native to Southeast Asia and Africa, like slipper orchids (Paphiopedilum) with maroon and green flowers, Leopard orchids (Ansellia) with yellow flowers and brown spots, nun’s cap orchids (Phaius tankervilleae) and other groups, all of these, surrounded with calla lilies. Hanging Nasturtiums (April)– The most traditional display in the museum. 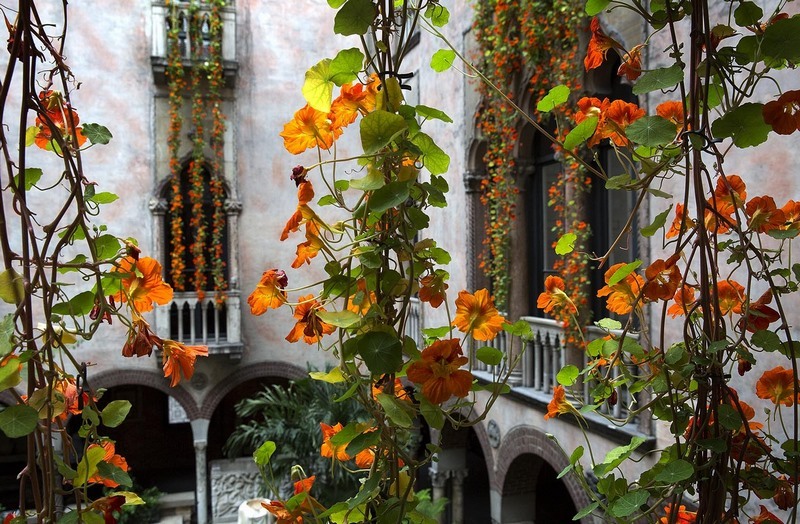 As Isabella did in the late 1800’s, hanging nasturtiums keep making a dramatic appearance above the courtyard. Cascades of flowering nasturtium vines grown in the Museum’s greenhouses, they require continuous care to ensure the dramatic length. Time to talk about color! After the Nasturtiums (also colorful), they place azaleas, blue cineraria, ivory and cream daffodils, and pines. Another Gardner Museum’s signature is the Clivia miniata. Flowering maples used to flank the steps and the statues. This is the most famous and labor intensive of the courtyard displays. The most notorious and common are the Hydrangea macrophylla, Hydrangea quercifolia, and Hydrangea paniculata among other specimens grant life and color to the courtyard. Violets, deep blues, and whites of the hydrangeas complement the delicate yellow oncidium orchids. Late-flowering hydrangeas are a great source of color and create a nice environment in summer. Mophead Hydrangeas and H. paniculata ‘Grandifolia’ fill in the courtyard and stand out among the statues, then, they introduce Agapanthus blue blooms. As the courtyard has small dimensions and tall walls, it remains fresh during warmer months, ferns and fountains’ water help maintain it that way. At this time of year, chimney bellflower (Campanula pyramidalis) appears in the courtyard. The Museum’s horticulturists grow this plant as a biennial, from seeds; it takes two years to get Campanulas to maturity (1,80m tall) and thrive in the courtyard. Late September is chrysanthemums’ time, different colors and species. It’s known that Isabella grew many chrysanthemums varieties, as a matter of fact, a pink-tinged chrysanthemum was named for her. 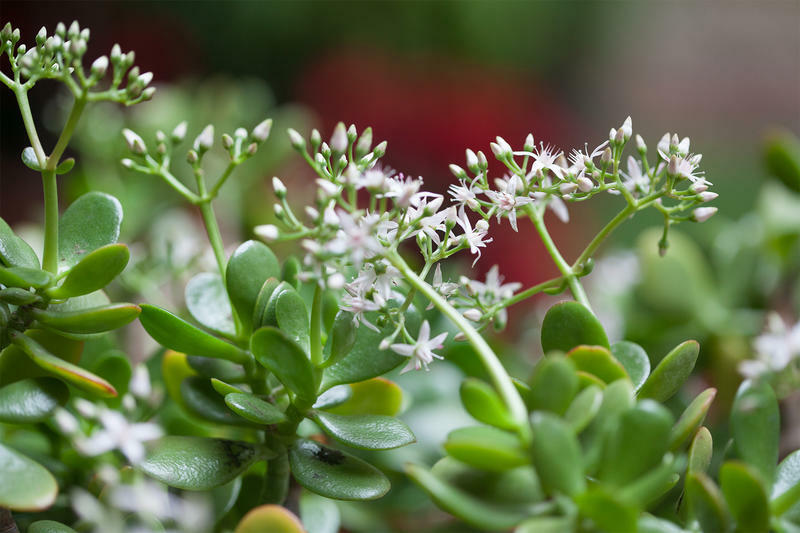 Holiday traditions at the Gardner Museum showcase flowering jade trees (Crassula argentea) raised in the Museum’s greenhouse for many years, the oldest ones are 60 years old, with trunks around 10 to 15 cm in diameter and 90 cm tall. Other plants thrive around the Museum like jade trees, like silver dusty miller, green aloe, and amaryllis red winter blooms. When I think about Gardens, I immediately think of some open space, full of plants (it’s summer, obviously), maybe some white Hydrangeas, private area, seating comfortably with a cold, super fresh glass of Lemonade in my hand. That’s it, talking about gardens always takes me to that place, that green and refreshing place where I drink Fresh Lemonade all day (apparently). So, Fresh Lemonade Gardens represents a window for those green lovers, like me, who want to feel good and comfortable in their own gardens and green (indoor) rooms; in other words: having a nice space to relax with plants around. This is also a place designed for those who want to learn how to take care of their plants, take the first step or several more in their gardens, or simply, for those who want to keep their plants alive with no effort. Tips and ideas on social networks (like Instagram) to show you how to organize your space with the use of plants. 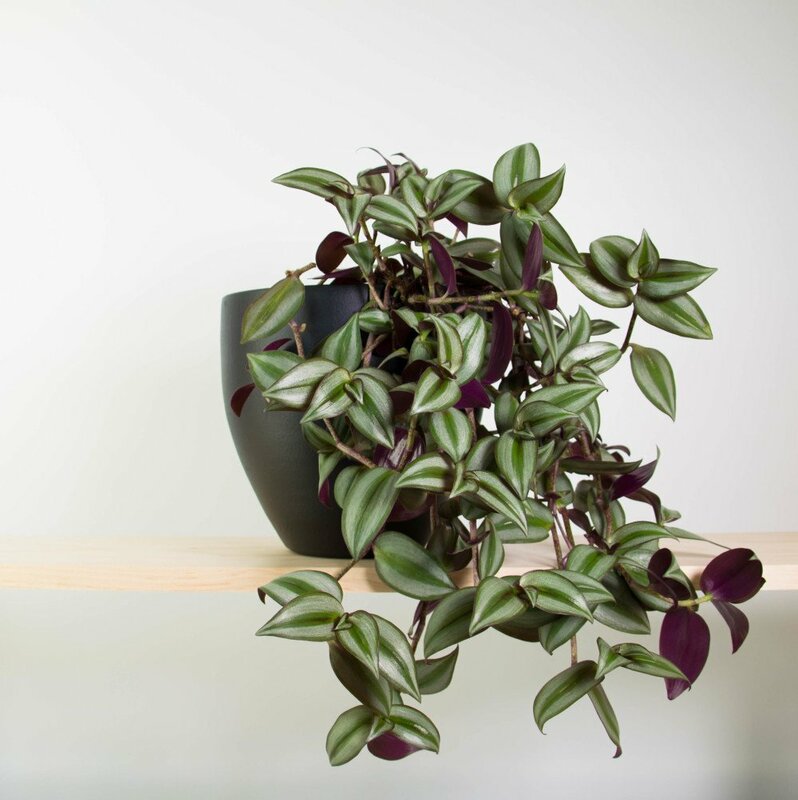 Information about specific plants and how can they light up your space. Personalized design for your own space: each month, we will publish images about green and fresh solutions for yours or others home, real examples of real homes. Short “one-on-one” sessions (30min max.) via Skype, where we’ll talk about your project. In each session we will dedicate time to facilitate yours and your plants life. To sum up: We will help you transform your space, with personalized solutions, examples, images and a list of things you have to do to, we can have Skype talks to guide you through the process and answer any questions you have. Easy right? Each proposed solution will be public, this way, everyone can have access to the information and use it as an example to create their own environments. We will try to get everyone to learn how to organize their own space with real examples. We would love to help you design your garden, terrace or balcony, living room or kitchen, lounge, workspace… you name it! We have got your back and your plants’. Believe it or not, planning a small garden takes time, it doesn’t mean it is a complicated thing, it means that we have to pay attention to details, we have to make it functional and “alive” through all the seasons. Let’s check out the top three things we have to keep in mind to prevent any fungus, diseases or even death of our plants. Orientation: The first thing we have to know when we want to plan a garden or even a small terrace is the sunlight. Take a weekend day to understand where’s sun or shadows in your garden and the time of the day when sun or shadow appear. This will help you with another step when it comes to choose which plants you want. For example: If you have a part-shade area in your garden, means that the sun arrives for 3 or 4 hours per day and then it becomes a shadow space, this indicate us that we can plant some plants that grows well with this amount of sun at day, like Hydrangea, Azalea, Heuchera, etc. Soil: Knowing the kind of soil we’re dealing with, will ease a big part of the work. I mean, if we know the type of soil, we can decided: if we have to use vases or if we can plant directly to the ground and, if we have to deal with rustic plants that grows everywhere of maybe those who grow better in an acid soil (“acidophilic” plants will reduce list of shrubs or trees and this is good news if you don’t know what to buy). If you do not what to deal with it, or maybe you have a terrace instead of a garden, you can always use vases and even trees grow well in vases, so there are no excuses to do it! Type of plants: If you have the time and you really love plants, you can use flowering plants, they will give your garden a very colourful touch through all the seasons. On the other hand, if you don’t care much about gardening or you don’t have the time, it’s ok! all you have to do is to use foliage plants, those who don’t have big or flagrant flowers but instead have a very extravagant foliage, they aren’t as “needy” as flowering plants and provide the colour your garden needs all year, even in winter. Hope this article help you take the first step and design your own garden.